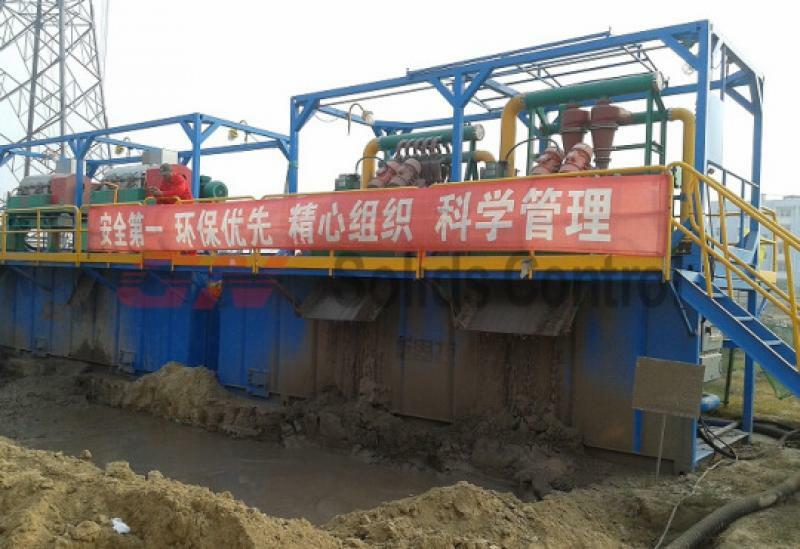 No Dig drilling is a kind of construction drilling , there are different mud recycling system design for no dig drilling with different model of mud recycling equipment and different qty with different layout . 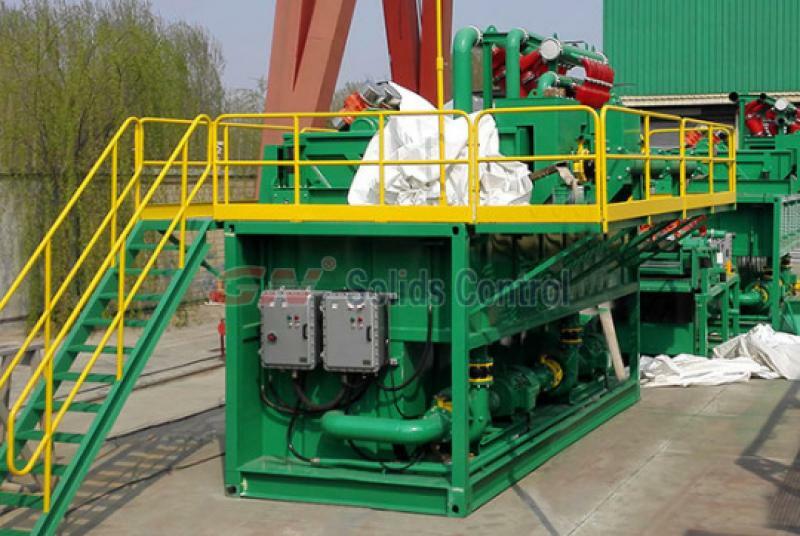 GNMS -500B mud recycling system is an economy option for 500 GPM mud capacity for no dig drilling mud recycling . Linear motion shale shaker sit on tank end with 500 GPM mud capacity by model GNZS703E –DZ top sit buffer box . The shaker deck angle is adjustable which will help solids discharge or solids dryness by adjust angle of deck . It can be installed frame plat shaker screen or pyramid screen depending on client option by 40 mesh size . Another set linear motion shale shaker sit on the other tank end with a frame which installed 1 set ten inch desander cone and eight sets four inch desilter cone . 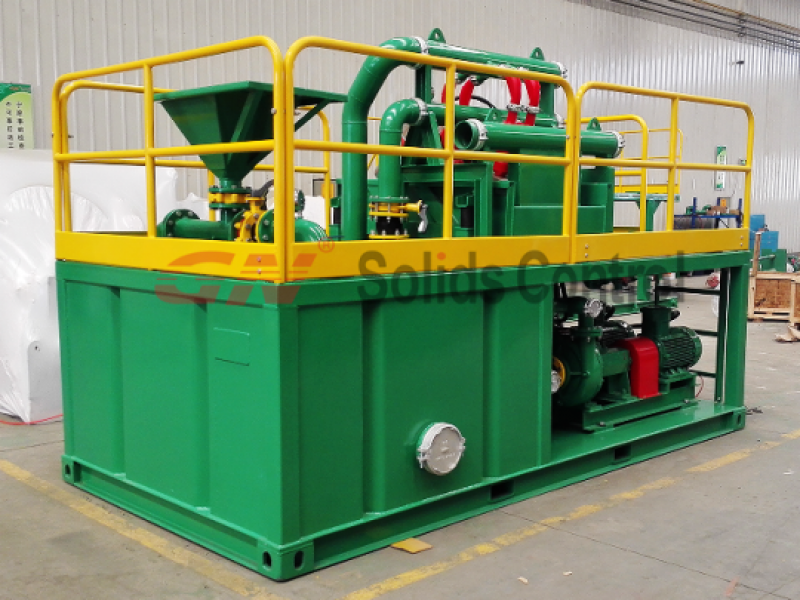 The desander and desilter cone can treat mud for 500 GPM capacity and the bottom shaker deck will be working for dry drilling solids discharged out of desander and desilter cone . One set 20 feet size mud tank to hold mud for mud recycling , the mud tank is divided into 3 compartments for different size of solids separation . There are 2 set centrifugal pump sit on tank skid , the 2 sets centrifugal pump will be working to feeding GNZJ703 -1S10N mud cleaner , one set pump feed for one pc desander cone and the other pump feed for eight pcs desilter cone . The desander cone can separate solids above 50 – 60 microns and desilter will separate solids above 20 micron . When delivery of GNMS- 500B mud recycling system , no need disassemble equipment , walk way and handrails can be folded on tank side, so the GNMS- 500B mud recycling system can be fast moving . 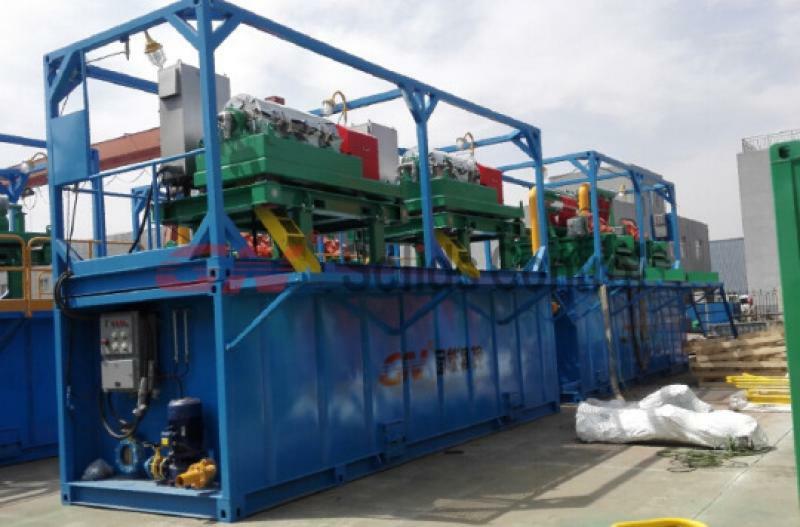 China Petroleum Pipeline Bureau with name China CPP for short, they purchased 500 GPM mud recycling system with and or without decanter centrifuge . The original purchase of 500 GPM mud system from China CPP is one tank 500 GPM mud system with one set linear motion shale shaker and one set liner motion mud cleaner to reach 500 GPM mud flow . 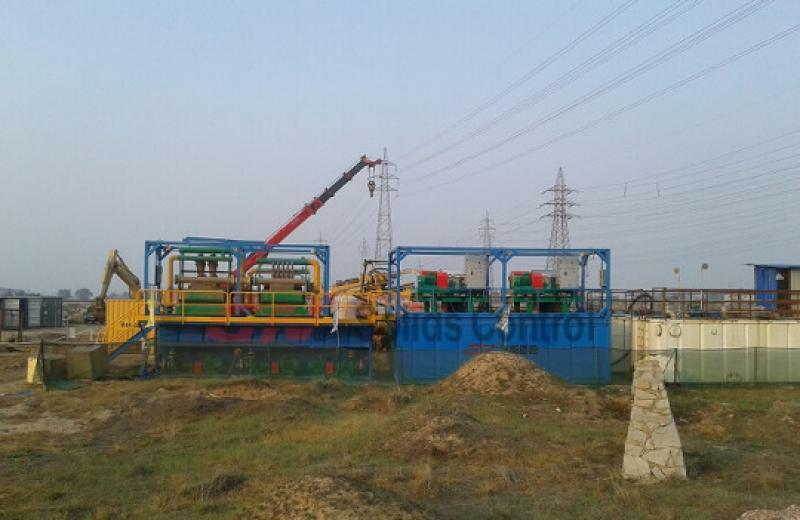 But this time, they ordered 1000 GPM mud flow with 2 set decanter centrifuge and 2 sets double deck shale shaker . There are 2 mud tanks totally , the first mud tank will install one set linear motion double deck shale shaker with 2 sets desander cones and one set linear motion double deck shale shaker with 12 sets desilter cone . The 2 sets linear motion shaker fit on a 20ft container frame for easy moving . The bottom tank is a 20ft container size mud tank to hold mud from shakers and desander / desilter cones with 3 compartment . The second mud tank is a 20ft container size mud tank , there are 2 sets decanter centrifuge installed on top which sit on another 20ft container size frame for easy moving . The mud tank is designed to hold mud from 2 sets decanter centrifuge after treated. 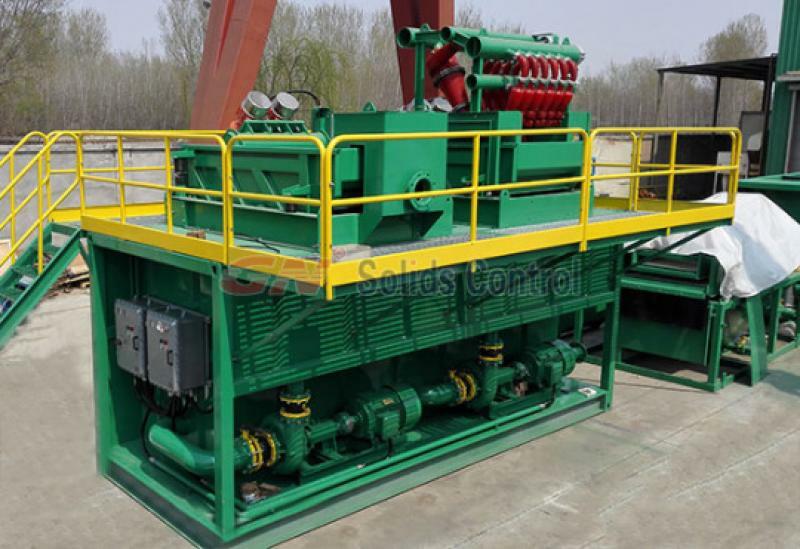 The middle speed decanter centrifuge will separate solids from 5 to 7 microns after desilter separation which made a great progress on separation for Trenchless mud system . 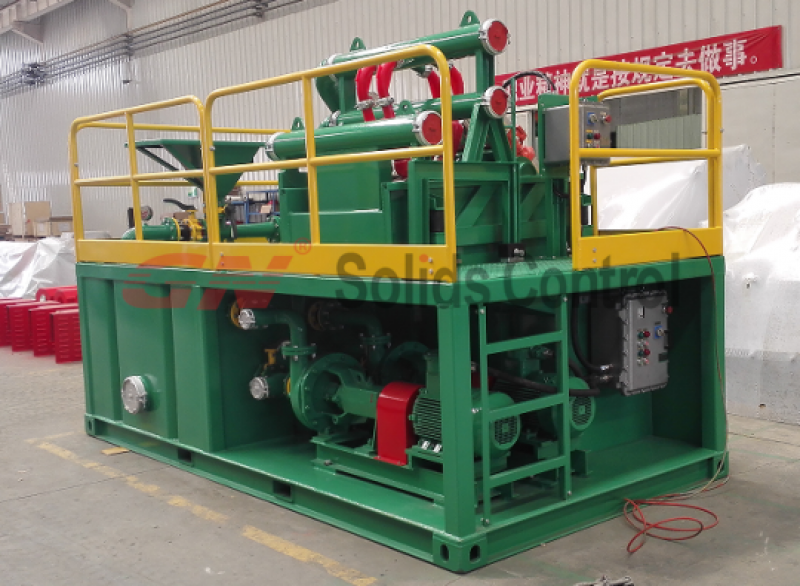 This 1000 GPM mud system is a very top configuration to contain 2 sets decanter centrifuge . The drilling mud will get heavier and heavier while drilling again and again by recycling cause fine solids will be more and more without a centrifuge , then there will be problem for driller , the 2 sets decanter centrifuge will make it easier while drilling cause they will separate the fines and keep drilling mud in a certain density .